The Yeti Speaks! : support Flutter, vol. 3 on Kickstarter! support Flutter, vol. 3 on Kickstarter! There's a new volume of Flutter coming out in 2017 - its third and final - and it's currently on Kickstarter from now until October 13th. Flutter is Jenny Wood and Jeff McComsey's coming-of-age trilogy about a girl who shape shifts into a boy to get the girl of her dreams. After winning multiple awards and getting some adaptation interest, the story is coming to a conclusion with this final volume. I was lucky enough to get to letter volume two and be a part of this book. I'll be lettering this new volume, and I've also jumped on in an editorial capacity. 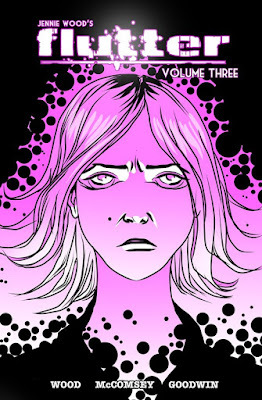 Chris Goodwin also returns from volume two to color this new edition! In addition to publishing the third volume, there'll also be a complete collection with all three volumes in one set. There are a number of rewards offered besides the book as well, from guitar picks to shirts to original art and personalized classes. Check out the video above and visit https://www.kickstarter.com/projects/372761059/flutter-volume-three-and-the-flutter-collection?ref=user_menu to learn more about this campaign!